Have you ever awoken with tight neck muscles and pain so bad you couldn’t turn your head? If you have, then you got a glimpse of what happens in myofascial pain syndrome (MPS). In this example, trigger points developed from sleeping with your head and neck in the wrong position. For most people the pain and stiffness will go away without treatment, but if you have MPS, it does not. The primary role of skeletal muscle is to provide locomotion. The musculoskeletal system works in tandem, like a finely tuned engine. But if the engine isn’t firing on all cylinders for too long, it will fail to operate smoothly. This is what happens in myofascial pain syndrome (MPS). Responding to muscle injury or micro-trauma, muscle fibers shorten causing a self-sustaining hypersensitive nodule called a trigger point (TrP). A trigger point is an irritated spot in a taut band of muscle that restricts motion and causes weakness and pain. Unlike isolated events, such as the example above, chronic myofascial pain results when compensating muscles, or muscle fibers in the same muscle, develop TrPs because of added stress. Feel around your body. If you find any knots that reproduce your pain by pushing on them, the pain is unexplained, and if the pain has gone on for some time, it could be MPS. Myofascial pain syndrome can aggravate or mimic other things. Here is an example. You experience numbness, pain, burning, or tingling that radiates, but when your doctor runs the appropriate tests, they are negative. In this example, we will explore the piriformis muscle. 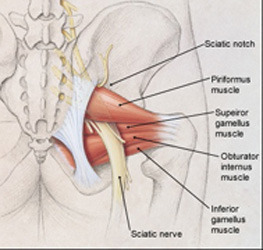 The sciatic nerve runs through this small deep muscle (as shown in the diagram). Trigger points in the piriformis can press on the sciatic nerve causing pain and other symptoms of spinal, pelvic, or hip disease. If you look at the location of the piriformis muscle, you can see why this is. *On the other hand, this does not mean TrPs do not contribute to pain in the presence of disease. If the disease process causes tugging, or muscle injury or weakness, you are at greater risk for developing MPS. A concise history is important to identify things we do each day, such as carrying a backpack, using a computer, or ignoring other perpetuating factors. It is important to rule out the possibility of MPS when you have been told your pain is unexplainable or your pain is not responding to the usual treatments for your disorder. For years, I didn’t know I had MPS because it takes someone with special skills for detecting and treating it. Some people are predisposed to MPS for a variety of reasons, but early intervention could keep an isolated event from becoming chronic. While medications may help, the only thing that will affect a trigger point is some type of hands-on intervention. Myofascial pain syndrome is not a progressive disorder in that it does not continue to worsen once trigger points are treated. People are working to raise awareness and educate others regarding myofascial pain. Treatment strategies for myofascial pain area very specific.